Buffalo Wild Wings is a hub for sports fans and wing lovers. During March Madness they partnered with Budweiser and 7 Media Group to help drive trafﬁc to their current mobile clubs. Three locations in different cities participated in the March Madness giveaway. The promotion used the restaurants Facebook page and in store kiosk to encourage patrons to sign up. Once a customer registered if they were chosen they would be given a team in the March Madness Tournament, if the team won they would win an iPad Mini. The goal was to run a promotion and utilize the current social media presence and mobile club. Pushing patrons to get involved in a promotion that would help to grow the mobile club and Facebook following for all 3 restaurant locations. 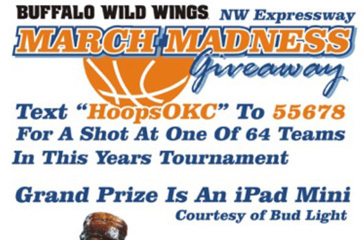 Buffalo Wild Wings used many outlets to promote the March Madness giveaway however, it all circled back to joining the mobile club. 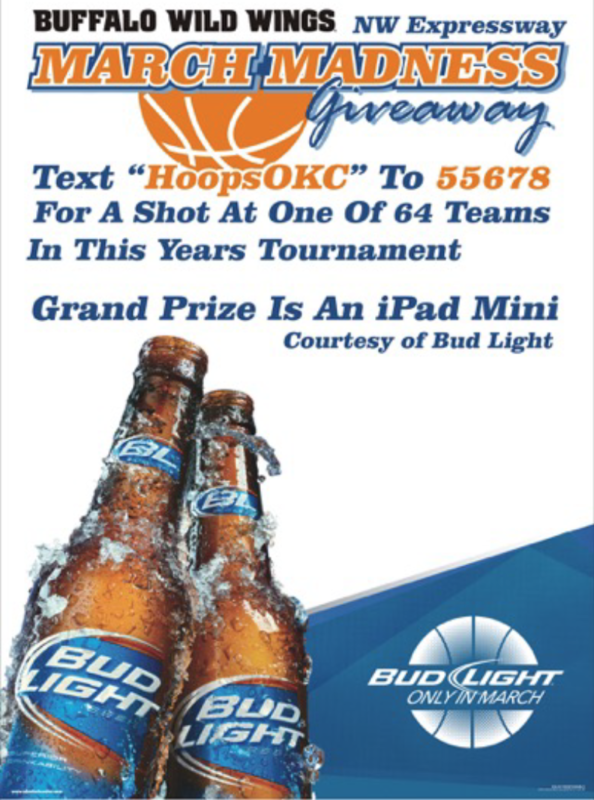 Text “HOOPSOKC” to 55678 for a shot at one of 64 teams in this years tournament. A kiosk was setup in the restaurant allowing patrons to register, in-store signage was posted and posts on Facebook gave full details of the promotion. Winners were announced on the Buffalo Wild Wings Facebook wall. During a 1 week promotion the mobile club increased it’s membership for all 3 locations by over 20%.